Machines, personality and Robot (1974) | Randomwhoness: a Doctor Who blog by Johnny Spandrell. Sampling stories in random order. “I think you must be the sort of girl who gives motor cars pet names”, sneers icy Miss Winters (Patricia Maynard) to our heroine Sarah Jane (spunky Elisabeth Sladen) during Part Two of Robot. 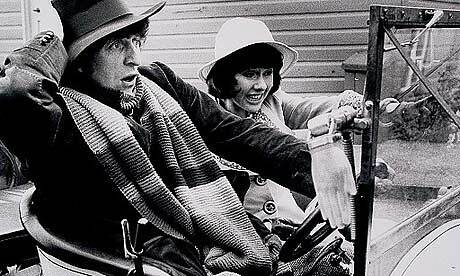 While Tom Baker’s nascent Doctor recovers from his recent regeneration, Sarah Jane takes the lead, chasing down a line on the scientific ratbags at Think Tank. Even once the Doctor’s back on his feet, his contribution is a series of Holmesian deductions, leisurely metered out. Sarah meanwhile is finding the robot, introducing herself to the bad guys, snooping and sneaking in and doling out the sarcasm. It’s like The Sarah Jane Adventures 30-odd years early. Miss Winters scoffed when Sarah worried about the titular robot’s “distress”. It had just been ordered to kill Sarah but found it could not complete the command. This caused “confusion in its neural circuits” and induced a dangerous swinging and tottering like a Hills hoist in a storm. Miss Winters though, shouldn’t have been so fast to scoff. Robot is all about treating a machine like a human. If Doctor Who‘s recent stories have given you cause to worry about its scientific plausibility, Robot‘s here to remind us it’s by no means a recent phenomenon. It’s got a robot which develops emotions. Said robot absorbs energy and grows to enormous size. Said robot’s made of a living metal susceptible to a metal virus. Suddenly Kill the Moon‘s blushing a little less rosily. In the Forest of the Night can stop hiding in those hydrangeas. It strikes me that emotional machines are a hallmark of seventies Doctor Who. In the 60s, the program viewed computers and robots as being cold and passionless, a threat to human emotions. It wasn’t just embodied in 60s poster boys the Cybermen. The War Machines, The Ice Warriors, The Invasion and so on all feature emotionless computers working in opposition to human ingenuity. And generally, the 70s tends to avoid mechanical baddies; the Cybermen headlined 5 stories in the 60s, and but only 1 in the 70s. Perhaps a growing comfort with automation and computers made them less of a novelty. So when we get computers and robots in the 70s, the tendency is to move in the opposite direction, towards humanising them. It starts with BOSS, the clearly loopy computer villain in The Green Death. It sings, it quotes Nietzsche, it speaks with a purring smarm. It even cracks a few jokes. Compare it to the humourless box which was WOTAN, the similarly maniacal computer in The War Machines. Times have changed. In Robot, the robot is anything but emotionless. It pines for its creator, Professor Kettlewell (Edward Burnham, a contender for owner of the most outrageous hair-do in all Who, a highly contested category). It wails when it inadvertently kills Kettlewell (funnily enough, the hair – wild, white puffballs at either side of the head – brings to mind Astroboy’s many named mentor). It has moments of compassion and of anger. It’s on an emotional rollercoaster. And no-one really treats it like a robot. When Winters and offsider Jellicoe (Alec Linstead) have to give it a tune up in Part Two, it’s conducted like surgery, not an overhaul. Kettlewell dotes on it like a child. “Yes, I think you could say it was human”, concedes the Doctor, unconvincingly at story’s end. Turns out everyone in this story is the sort of person who gives motor cars pet names (Especially, the Doctor who actually has given his car a pet name and drives it around through proceedings). It’s a theme which endures throughout the 70s. The Face of Evil gives us a computer which goes mad through an excess of personality. Underworld a computer that believes it’s a god. The Robots of Death gave us kind-hearted detective D84. Pompous justice bots in The Stones of Blood. A sultry temptress of a computer in Shada. Even that lone Cyberadventure gave us an unusually emotive Cyberleader. Then there’s K9, a robot dog who jokes, sulks, seeks praise and shows pride. We’re surrounded by machines behaving in very unmechanical ways. On some occasions, it’s just for laughs. But on most occasions, I think it just makes for better drama. There’s just not much entertainment you can milk from a monotone voice or a faceless metal helmet. So maybe these funny, funky machines weren’t added because they were thought of as feasible, but just because they made the stories better. Funnily enough, it more or less ends in the 80s, save for the odd shape changing android about the place. But new Who? Crazy computers and wacky androids all over the shop. Comedy robots in Dinosaurs on a Spaceship. Villainous Gus channels Hal in Mummy on the Orient Express. Computer/human hybrids like Cal in Silence in the Library and Psi in Time Heist. The machines are gradually becoming human; literally in Deep Breath. But let’s end on a different note. That Brigadier (Nicholas Courtney) knows how to keep his cool. He’s there to witness the third Doctor’s regeneration into the fourth. He watches it calmly, then efficiently arranges for the Doctor to be transferred to the sick bay, complete with his own personal physician. Then he’s swiftly back to the paperwork. “Everything seems pretty quiet”, he tells a bewildered Warrant Officer Benton. Considering that only moments ago he saw one man morph into another, he’s got a unique idea about how a day qualifies as “pretty quiet”. The Brigadier sings some of his greatest hits in Robot. ‘All the rest were foreigners’, ‘I’d like to meet an alien menace that wasn’t immune to bullets’ and ‘Cancel the destructor codes!’. He’s funny and heroic and engaging throughout. He’s the antithesis of robotic, emotionless conformity. Imagine turning him into a Cyberman. What a strange decision. But perhaps it shows that Doctor Who is never going to stop trying to make the machines human. LINK TO… Time Heist. Both feature robberies. And subterranean bases again! NEXT TIME. The Ultimate Foe. All together now: there’s nothing you can do to stop the catharsis of spurious morality!